Employers want to know about your past expectations to see if what you expected from your last employer was reasonable, how well the role worked out for you, and if your expectations match the job responsibilities for the new position. While there is no right answer to this question, you want to be honest, positive, and specific. Be honest, but positive. If the job wasn't exactly what you expected, it's fine to mention that. However, you should focus on the job itself, not the company, your boss, or your co-workers (if they were a problem). Do be careful how you answer and don't focus too much on the negative. Instead, address the highlights of the job. When the job you're interviewing for is very similar to your previous position, you don't want to lose consideration for the new job because you didn't like the old one. Be reasonable. Perhaps you had unrealistically high expectations for your previous job, and they weren’t met. Don’t share any unrealistic expectations in the interview. Focus on realistic expectations you had for the job; you don’t want to seem like an employee who expects too much from a position, colleagues, or a company. Be specific. When responding, be specific. You can focus on one of a variety of topics when referring to “expectations,” from the office environment to your assigned duties to the support from your employer. Once you pick a focus for your answer, prepare some examples to share with the interviewer. For example, if your job involved creating web applications, discuss the specific programs you developed and the responsibilities you were given. Don’t focus on money. While you can focus on a variety of topics, money is not one of them. Whether you were satisfied or dissatisfied with your salary is not important to the interviewer. If you focus on salary, the interviewer will worry that you care more about money than the work itself. Think about your current job. When selecting the focus of your answer, keep the job for which you are applying in mind. 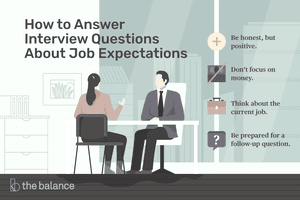 Think about what sorts of expectations you have for this job, and connect them back to your expectations for your previous job. For example, perhaps you know this company provides professional development for many of its employees, and this is something that is important to you. In that case, you might mention the training opportunities for professional development that helped you achieve your goals at your last job. Be prepared for a follow-up question. Be ready to discuss what you expect from a supervisor, and from the company. My expectations for my previous job were that I would be teaching my students a completely new eighth-grade English curriculum that I would have to develop myself, but that I would have the support of a co-teacher in all of my classes. This blend of support and independence allowed me to successfully develop a new curriculum that is still used in the school to this day. In my previous job, my expectation based on the job description and interview was that my job would involve working primarily on team-based projects. Ultimately, many more of my projects than expected were ones I developed and completed on my own. While my expectations were not quite met, this independence allowed me to greatly strengthen my skills in all aspects of project development. One expectation I had for my previous job was that I would have the opportunity as an administrative assistant to step into a variety of leadership roles. This expectation was met. For example, I became the supervisor and trainer for all interns and part-time administrative employees. I also attended a number of seminars on leadership and management. I believe my experience and skills as a manager will serve me extremely well as a supervisor at your company. I was responsible for hiring in my previous role. I expected that the position would expand to cover employee training and development, and those expectations were met. I was successfully able to coordinate hiring, onboarding new employees, and employee development programs for current staff.